Life In A House of Blue ! : Alice.com : Everyone Needs An Alice ! Home > Review > Alice.com : Everyone Needs An Alice ! Alice.com : Everyone Needs An Alice ! As a mom of three boys going to the store can be a chore, especially during the summer with all of them home. I have a 13 yr old that wants to stay home alone (I am not ready for that, neither is he) and puts up a fight. My 10yr old wants to put everything in the buggy that he sees and does not understand why I can not buy it. Alice.com is a service I was able to try and I really like. It will let me keep my sanity while buying what I need. 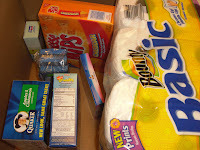 Alice provides you a better way to manage all of your household essentials online. You tell Alice what you buy—choosing from great deals on 1000’s of products—and Alice goes to work. We organize all of your products, find coupons and deals for you, remind you when you might be running low, and help you order just the items you need so you can avoid that trip to the corner drugstore or the big-box store. And all this convenience comes direct to your door with free shipping included. I never thought I could afford a service like this but it seems to SAVE me money ! It is very simple to use.... the first step was to create an online account. It was very easy and FREE. Once my account was set up , I was able to enter the site and start searching for great deals. One of the first things that I noticed was the prices were about the same at the store or cheaper !!! Alice.com will apply any coupons to your item that is available which is great , I always cut them out and do not bring them with me to the store. It was also nice that you could select for each product a reminder to order that item in the future, that way you will never run out ! I received $25.oo from Alice.com to give the service a try. Below is what I purchased. The total was only $24.20 for the 7 items ! The best part was my order was delivered to my door in 3 day for FREE !!! 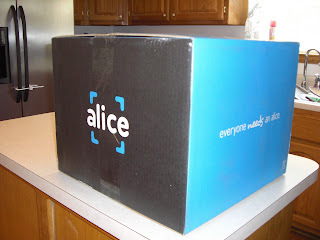 With Alice.com your order always ships FREE !! Give Alice.com a try ! Sounds like a cool service...I would have to compare prices on the items I buy (bogo items, etc to see if it would be cost effective for me) Thanks for reviewing this service. Dontcha just love Alice?? Boy it sounds so darned convenient!! I am so thinking it would be great for the elderly or someone recuperating from surgery or New Mom's etc!! Thanks for a GREAT Review!!! Your Blog is looking so GORGEOUS!!!! What a steal! I have to check it out. Sounds like it could be a great service if the prices work out for you. I'm always comparing, but it would probably work out in the time it would save me. I sometimes use the local shopping service at our grocer. Order online, but you still have to go pick it up and they charge a fee. But its worth it sometimes, so I'll have to look into this Alice thing. Brings back memories of the Brady Bunch and Alice shopping at Sam's!! !